21st Century Statecraft: What’s New? Launched this past January in a speech by Secretary Clinton, “21st century statecraft” attempts to push American diplomacy into the digital age. Yet, as revealed in a recent article in the New York Times magazine, there seems to be a significant gap between what the proponents of 21st century statecraft believe and the policies they pursue. The beliefs including ending the era of “white guys with white shirts… determining the relationship”, replacing ideology with openness, and broadcast with conversation. Yet the policies described in the article reveal a shift in the type of “white men in white shirts” making policy decisions: away from career diplomats and towards young staffers and technology entrepreneurs. 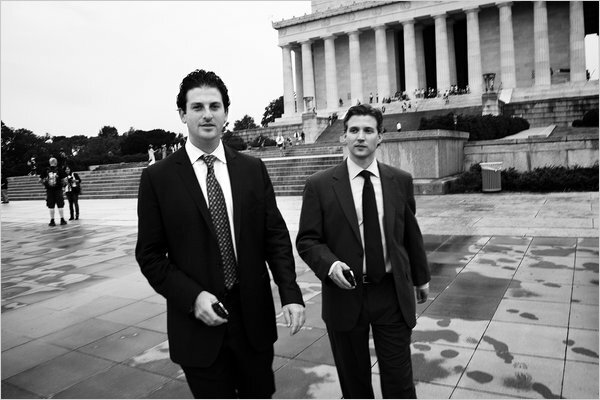 The article opens with a full-page photo (left) of the two young leaders of this movement – Jared Cohen and Alec Ross- walking in front of the Lincoln Memorial, Blackberries in hand: two white men in white shirts shaping the (new, digital) relationship America will have with the world. Among the activities described in the article are meetings with the Mexican billionaire (and richest man in the world) Carlos Slim to talk about anti-crime mobile phone apps, a discussion in Silicon Valley with Google CEO Eric Schmidt about tracking Kenyan NGOs (also through mobile phones), and the work of the special representative to Muslim communities developing appealing pro-US messages that Muslim Twitterers will hopefully re-broadcast to their followers. Despite the affinity for new apps and gadgets, these activities have the same air of elitism and dictated solutions as earlier American foreign policy efforts. Bringing Google expertise to Kenya to build mobile apps is not functionally different from bringing an American construction company the Kenya to build a hydroelectric dam. It is using American ingenuity to solve another country’s problem in an innovative way. Supporting American business is a fine policy for the American government to have, but it should not be confused with foreign policy innovation. Using cell phone apps for diplomacy instead of large infrastructure projects is not revolutionary, just a recognition of technological advancement. Another key belief of 21st century statecraft proponents is that “the 21st century is a really terrible time to be a control freak.” This implies a shift from foreign media outrightly funded by the US – like Voice of America, Al Hurra, and Tolo TV – to whispering sweet nothings in the ears of influential twitterers in targeted countries. Yet, – this is still a centralized broadcast view of media. It is still far from the reciprocal, post/comment, read/write, peer-to-peer model of networked media. America is still the one speaking and others around the world are expected to listen. As such, 21st century statecraft may elicit a thawing of hostility towards American foreign policy, but it is just as likely to earn continued skepticism from digitally-engaged people around the world who see that the foreign policy of a nation state is not easily changed by digital technology. This is not to say that people is the US government are not working hard to use technology to transform America’s role in the world. In a recent panel discussion I participated in at the New America Foundation I shared the stage with Robin Lerner of the Senate Foreign Relations Committee, Katharine Kendrick of the State Department’s Internet Freedom office, and Josh Goldstein, who helped design the State Department’s Apps for Africa project. These people are asking tough questions about the capacities and limitations of the institutions they work for. They are leading by listening. What more can be done by those in US government? First: listen more. Instead of engaging with billionaires and titans of tech, meet with local activists where it is safe to do so. Stop looking for solutions in Silicon Valley and start looking within local societies, as the Apps for Africa contest is doing. Unlike my more cynical colleagues, I do believe that the American government can do good for digital activists around the world, but that will mean truly changing the way we engage, not just digitizing the message.